Jean (my wife) was on another quest. 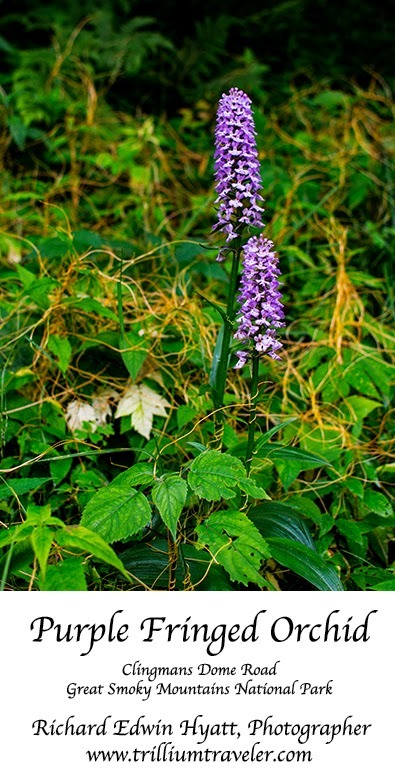 To find the Purple Fringed Orchid Platanthera grandiflora. So, off we went to the Clingmans Dome Road in the Great Smoky Mountains National Park because she had read that they were currently blooming there. Sure enough, as we rode along she spotted one and then another. We stopped the car and started shooting photographs of this wildflower. There are two species and this is the larger of the two. The flowers are approximately 1" wide as opposed to the other, Platanthera psycodes, which is said to have flowers 0.5" wide. After finding more along the road we continued to the Clingmans Dome parking lot and even found a couple there. The temperature was in the low 50s and I was still dressed for the upper 80s. Having recently removed my cold weather clothes from the car I decided not to climb to the tower on top of Clingmans dome. Guess I wasn't being a good boy scout. I wasn't prepared! If you want to see this wildflower the time to go is now. Below is a link where I got some of the information to write about this flower, along with, more information and locations to find it in Western North Carolina. FYI, the Clingmans Dome road and Appalachian Trial here are on the border of Tennessee and North Carolina but, your cell phone may tell you you are in Kentucky!